Where were the first Winter Olympic Games held, and how is this year's Olympic venue different from all others? Which country has hosted the Winter Games the most and in which cities? What are the official Olympic sports competitions at the Winter Games? There are fifteen displines in all at the Winter Games, most of them traditional like Alpine skiing, biathlon, bobsled, cross-country skiing, curling, ice hockey and figure skating, and some of them relatively new to the games -- like the very exciting snowboard and freestyle skiing competitions. Newly introduced at the 2018 Games? They include air snowboarding, mixed doubles curling, mass start speed skating, and mixed team alpine skiing. When and where will the 2018 Winter Olympics take place? The 2018 Winter Olympic games take place in PyeongChang, South Koria. The games officially begin on Thursday, February 8, 2018 followed by the official opening ceremony on Friday, February 9. A tradtional two-week long event, the Olympic games wrap up with closing ceremonies scheduled for Sunday, February 25, 2018. Pronounced pyahng-chang, PyeongChang is located 110 miles (about 2 1/2 hours by car) east of Seoul, the South Korean capital city. PyeongChang is famous for its majestic mountains which makes it ideal ski territory and a natural venue for other outdoor winter sports. In its gritty determination to host the games, PyeongChang lost out to to Vancouver, Canada (2010) and Sochi, Russia (2014) -- but their persistence paid off. The third bid was the lucky charm! The 2018 games in PyeongChang mark the third Winter Olympics in Asia after the 1972 games in Sapporo, Japan and the 1998 games in Nagano, Japan. 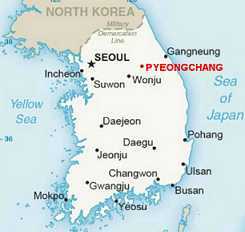 PyeongChang is the first city in South Korea to host the Winter Olympics. The 1988 Summer Olympics took place in Seoul, South Korea. Who is the mascot for the 2018 Winter Olympic Games? prowess, the white tiger is viewed as a guardian that helps protect the country and its people in Korean mythology. What country has hosted the Winter Olympics more than any other? The United States has hosted the Winter Olympics four times : 1932 in Lake Placid, 1960 in Squaw Valley, 1980 in Lake Placid, and 2002 in Salt Lake City. Where will the next Winter Olympics take place? 2002: Salt Lake City, U.S.